Twist with biscuits is an interesting theme as its so easy to include biscuits or cookies into making a quick dessert. Everyone on the group was wondering what to make. Some suggestions came along like using savory cookies or biscuits for bhel, or a no bake cake etc. I had made up my mind to make an easy dessert recipe as its really dear to my heart. Mind you, I’m eagerly waiting for the biscuit bhel recipe. My eldest son did his Hotel Management and Administration from a Swiss Hotel Management School. When he came home after his first semester, his fingers had so many cuts. Being a mother, my heart hurt that his fingers were hurting. He was learning how to chop like a chef. During his stay at home, he would make some interesting recipes that he had learnt. Back then it was not common to have avocado in a sandwich, have mint in pineapple. He taught me all those things. The evenings were the best as he would disappear into the kitchen and tell me to stay out. He would make quick desserts using ingredients available at home. One of his creations that I really loved was this trifle he made. Till today it had no name but today had to give it a name – easy fruit trifle. Usually trifles have cakes as the base, have both jelly and custard along with fruits, cream, nuts. However, this easy trifle recipe requires no cakes, custards or jelly. Just a few ingredients like cream, biscuits or cookies and fruit. This dessert is a burst of different flavors, sweetness from the mango, tanginess from passion fruit, a slight spicy taste from the ginger nuts. What I love about these quick trifles is that in a matter of minutes dessert is ready. I’ve used on occasions strawberries with coconut biscuits, mixed fruits with chocolate biscuits. They all taste really good. Sometimes I’ve served it ice cream instead of whipped cream. Next time you have unexpected guests over, or don’t have time to make an elaborate dessert, this one is so easy to prepare. Add the cream to a container. Add powdered sugar. Whip till soft peaks are formed. You can make the trifle in one big bowl or in individual containers like dessert bowls or glasses. Snap the biscuits with your hands into small pieces. Make a layer using half of the cookies. Top it with half amount of fruit. Add half amount of passion fruit pulp over the fruit. Top with half amount whipped cream. Repeat the layers again, broken biscuits, fruit and cream. Garnish with chopped nuts or chocolate chips. Drizzle passion fruit syrup over the trifle. Let the trifle chill in the refrigerator for 30-60 minutes. To make passion fruit syrup take ½ cup passion fruit pulp and whizz it lightly in a blender. Strain the mixture. Throw away the seeds. Measure the passion fruit juice. Add ½ or ¾ part sugar and mix well. Whatever syrup is left can be made into a fresh juice by adding some water. I used mango as it paired well with passion fruit. You can add any fresh fruit or a combination instead of mango. Replace the ginger nuts with other biscuits like digestives, coconut or oreo. Serve with ice cream instead of whipped cream. Oh, the fruit trifle looks so good! 🙂 Interesting that you’ve used passion fruit syrup and ginger cookies along with the other usual ingreingredients. I can only imagine what a beautiful burst of flavours this dessert would be! Thanks Priya, ginger cookies and passion fruit compliment each other very well. This fruit trifle is certainly a visual treat and I have no doubt that it tasted great with all those juicy fruits , cream and cookies going in. I love the use of ginger cookies in this recipe di, it must have complimented very well with sweet and tangy flavors of the fruit. Thank you so much Poonam. Thank you so much Rosy. Thank you so much Sasmita, I love using ginger cookies. Ohhh my my such a delicious looking Trifle!! Ginger cookies and Passion fruit are my favorites. Super lovely share dear. Thank you so much Shalu, I too love the passion fruit and ginger cookies combination. I have found your blog interesting so I have written a short review on it. I’m writing food and wine blogs review as part of the project of making independent review of blogosphere. I do it with my friends from Japan – young sommeliers and chefs, that’s why I run also a Japanese version of the blog. Thank you so much for the very kind gesture, Walter, I am truly honored that you found my blog interesting. I am working on the main menu to make it more user friendly. The way you described my blog has left me speechless. Once again thank you so much. One of the favourite desserts at home. It is tasty and using biscuits seems like a little lesser calories too. Nice share. Thank you so much Jayashree. The trifle looks so good! Beautiful capture as well. I must say with all those fusion of flavors it really is a treat for the tastebuds. Love this!!! Thank you so much Geetanjali. They certainly are easy to put together, thanks Freda. Looks amazing Mayuri! 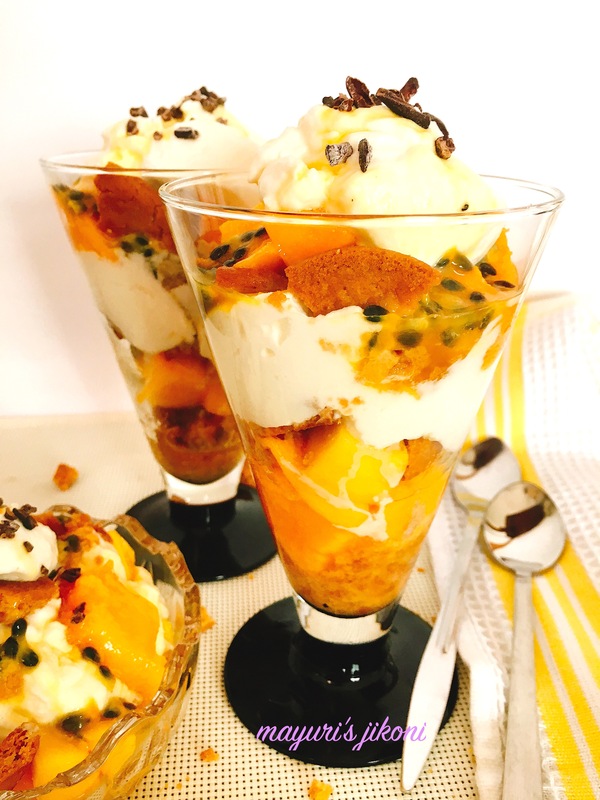 I love trifles; so easy to make with whatever you have and so, so decadent too! So interesting you have used passion fruit; need to try that next time! Thanks Vanitha, I just love passion fruit so try and use it in desserts whenever I can. Mango and passion fruit, goes well together, one of my favourite combo. Perfect and easy dessert to try it out over the weekend after spicy meal. Thanks Jagruti, yes its an easy dessert to put together. The fruit trifle looks delicious. Must have been a delicious feast both visually n gastronomically. Awesome share. Thank you so much Archana.